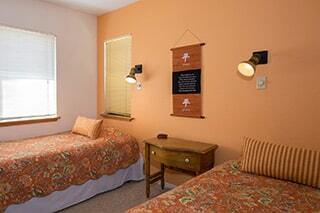 Each guest room includes two twin beds, carpeting, heat, air conditioning, towels, and bedding. A limited number of queen-sized beds are available. 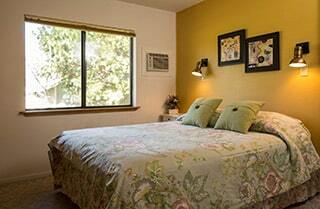 Fresh linens and towels are available weekly – no daily maid service. Wi-Fi is available for all guests except those in cabins or tents. (We also have centrally located guest computers.) Limited handicap accessibility. 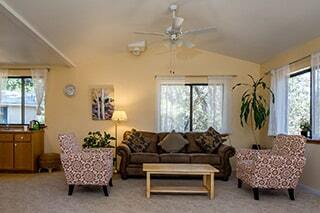 Each room has a private entrance, a private bathroom, air conditioning, a ceiling fan, and a hairdryer. Harmony House is dedicated to expressing Yogananda’s expansive approach to religion and his belief in celebrating God through beauty. Simply and elegantly appointed, each room is decorated in the theme of one of the great world religions. 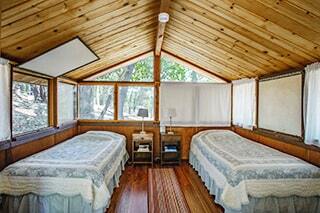 Serenity House is an inn-style house with twelve air-conditioned rooms and four hall bathrooms. Most rooms have twin beds, bedside table, wardrobe, heater and A/C unit. It has a comfortable lounge/classroom equipped with a video player, library of inspirational videos and a small refrigerator for personal items. On occasion, the lounge is used as a classroom, so it is not always available. We are building a new Temple with 2 new classrooms, so that will change summer of 2019. Each cabin has one room, which is larger and more private than other standard rooms; cabin occupants share separate men's and women's shower houses about a minute’s walk away. All cabins have A/C. We have sites for those with their own Tent or RV. 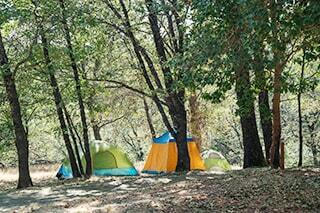 Tent camping is available on varied campsites. Camping has moved closer to the shower houses and main buildings. The new sites are below the shower houses. RVs are welcome year-round, but we do not have RV facilities or hookups. Guest Services staff will show you the options for camping or RV stays. Meals are included for Tenters and RVers. Tent spaces DO NOT include facilities for cooking or picnicking. We are in fire country. No campfires are allowed. Tenters cannot use candles, kerosene lamps, or anything with an open flame. We live by the woods. Because of animals, food is not allowed in the tenting area. We have a refrigerator on an outside deck behind our kitchen, which is available for use by guests. The tent sites are close to the shower houses, and there is an outhouse. Men's and women's bathrooms are available with showers, toilets, and sinks, a couple minutes' walk from most tent sites. RV sites are a little bit further away, but still close to the main campus. People choosing to camp in winter conditions are asked to sign a waiver accepting responsibility that will be provided by our Guest Services staff. All outdoor accommodations have access to separate men's and women's shower houses an easy 2 or 3-minute walk across the meadow. Facilities have flush toilets, plenty of hot water, and shower and toilet partitions for your comfort and privacy.